Bloat is a buildup of gas in the abdomen, usually caused by digestion or swallowed air. Here are a few things you can do to combat it. We all have our own unique eating styles and food preferences, but most of us have a strong dislike for bloat. Agree with me? I thought so! As a nutritionist, I hear this complaint frequently from my clients. If you feel bloated more often than you’d like, here is a simple guide I created to help you keep that belly bloat at bay. First, a little bloat 411: Bloat is a buildup of gas in the abdomen, usually caused by digestion or swallowed air. Feeling bloated can result from an overgrowth of bacteria in the small intestine. This bacteria ferments food, creating gas that causes bloating. In other words, you feel like you’ve been blown up like a balloon. Similar to bloating is water retention. This lovely (not!) feeling is usually caused by consuming too much salt (beware of processed foods). High levels of sodium cause your body to hold on to extra unwanted fluid. Not only can bloating and water retention be uncomfortable and less than attractive, it can be downright painful. Here is a guideline to beat the bloat. 1. Non-nutritive sweeteners: When it comes to bloating, sugar alcohols are often a culprit. While they are derived from sugar, sugar alcohols have a different chemical structure that alters the way the body metabolizes them. Sugar alcohols are considered low-digestible carbohydrates because they’re either partially absorbed in the small intestine or not absorbed at all, and this means they can cause some unpleasant symptoms. These are most commonly found in sugar-free products, low-calorie foods or baked goods. 2. Carbonated beverages: The bubbles found in carbonated beverages may be oh so satisfying, but they can also build up in your stomach, causing uncomfortable bloating and gas. If a flat belly is what you’re after, it’s best to avoid the bubbles. 3. Cruciferous veggies: While I absolutely recommend these veggies as part of a healthy diet (broccoli is a fave! ), steer clear on the days you’re trying to really cut the bloat. Because of their complex sugars and high fiber content, it’s harder for your body to digest them, often causing unwanted gas. Brussels sprouts, kale, cabbage and cauliflower are the most common offenders and often cause some discomfort when it comes to digestion. 4. Dairy: As we age, we lose the enzyme needed to break down and process milk sugars, and the side effect is often bloating. Try ditching milk, yogurt and cheese. If you notice a positive difference, try adding dairy foods back one at a time starting with yogurt, to see which dairy product is the offender. 5. Starchy foods: Starches, especially the processed ones like cereals, pastas, breads and crackers, hold on to water, which means your body will too. You can go without the toast and pasta, or choose whole-grain and less processed options like brown rice instead of white, root vegetables and oats. 1. Asparagus: This veggie is a great source of folate and vitamins like A, C and K, and contains a compound called asparagine, which allows it to act as a natural diuretic. 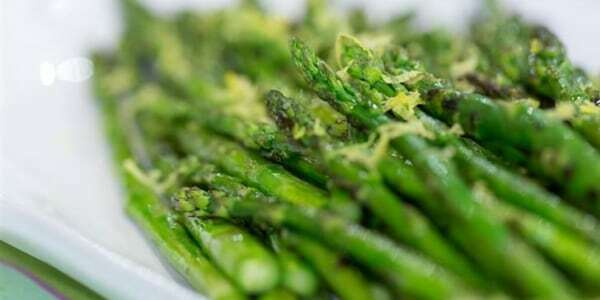 This means asparagus can help with digestion and bloating. 2. Dandelion tea: In the past, dandelion roots and leaves have been used to treat everything from liver problems, kidney disease, swelling, skin problems, heartburn and upset stomach. Because of their natural diuretic effect, dandelion leaves are now often used in tea as a de-bloating elixir. The tea will help flush out any excess water weight. 3. Fennel: This veggie acts as a diuretic, helping you to flush out the excess water you may be retaining. It has a slight licorice flavor that also adds a crunchy freshness to a variety of dishes. Toss fennel in your salad, roast instead of broccoli or make it the star of your next crudité platter. 4. Non-cruciferous veggies: Veggies like cucumber, spinach and celery are full of water and digest fairly easily, making them the veggies you want to fill up on. 5. Papaya: This tropical fruit contains a special enzyme called papain that helps aid digestion and the breakdown of protein. Thinly slice this fruit and couple it with a piece of grilled chicken for a snack or sweeten a smoothie with a few cubes to have the same effect. 1. Eat fermented food once a day: Foods like kimchi, sauerkraut, pickles, kefir and kombucha are naturally high in probiotics. Like the probiotic supplement, fermented foods introduce good microorganisms that can contribute to maintaining a balanced, healthy gut. 2. Drink up: When you’re dehydrated, your electrolyte levels can become unbalanced. This means you could be holding on to unwanted water weight without even realizing it. Drinking more water does not mean more water is retained. Drinking more water means your body can flush out any excess (along with toxins) more easily. 3. Move more: You can be eating the right foods, but if you’re spending all day sitting, the stagnation can cause unwanted gas buildup. Make a point to get up and move every hour. Drink flat water with lemon throughout the day! For more advice from Keri Glassman, follow her on Instagram. This story was originally published on Feb. 2, 2018.